The former British prime minister’s family member has previously sailed illegally to Gaza on a flotilla boat. She joined an anti-Israel rally in London Trafalgar’s Square, where another protest today (Sunday) may be the last as the mayor London vows to crack down on the incitement as the date for the next Olympics approaches. "The Mayor believes that intolerance of our fellow citizens and hate crimes against specific communities are totally unacceptable, particularly in a city like London and especially in 2012 when the eyes of the world will be on the capital,” said a spokesman for Mayor Boris Johnson, the London Jewish Chronicle reported. The spokesman added, “The Greater London Authority will not be authorizing political rallies in Trafalgar Square during the Olympic and Paraolympic Games." 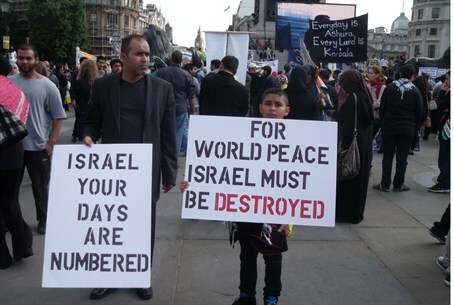 The Trafalgar Square rallies against Israel have featured Hizbullah flags. During Ottoman Islamic rule, Jews were second-class citizens, called "Dhimmis". The myth of their "peaceful lives" has been debunked by historians, although they were not subject to pogroms as frequently as European Jews.. In fact, Jordan, during its occupation of the Old City and other parts of Jerusalem, Judea and Samaria between 1949 and 1967, denied Christians and Jews all access to holy sites except for visiting dignitaries. Israel opened up the sites to all religions after it restored the areas under its sovereignty in the Six-Day War in 1967.